If you’ve never tried Nepalese food, you’re missing out. So do yourself a favor and try a momo – or a “Nepalese empanada,” as I now call it – a dumpling with a variety of delicious fillings, often vegetables or minced meat, that can be steamed or stir-fried and is often served with spicy dipping sauces. Sound good? I learned to make momos from a Nepalese lady who is a maverick in the kitchen. Her name is Ambika (but I respectfully call her Ambikaji), and she makes the most mouth-watering, velvety momos you’ll ever try. Here’s the best part: she didn’t just share a recipe with me; she showed me how to make them in person. I feel so lucky to have met Ambikaji. Not only is she a master in the kitchen, but she’s also a hardworking woman with an open heart and an unwavering determination to build a better future for herself and her family. We met by chance. She lives in Arlington with her husband and two children. She babysits Monday through Friday for a family of engineers in Lexington. On the weekends she works in Allston, where she helps my neighbors with house chores and cooking for some extra cash. Ambikaji’s husband works at a store. Their oldest boy is 18 and about to become a freshman at Suffolk University. Their youngest will be going to college very soon. She needs to put her shoulder to the wheel. My neighbors often invite people over for dinner. When they do, they usually serve Ambikaji’s Nepalese dishes. So many guests have been so impressed with the food that we started asking our neighbors whether we could get in on the action. Will Ambikaji cook for us? So my neighbors had an idea: What if Ambikaji started her own meal delivery business? That way, all of us hungry fans could have access to her food and she could make more money, right? 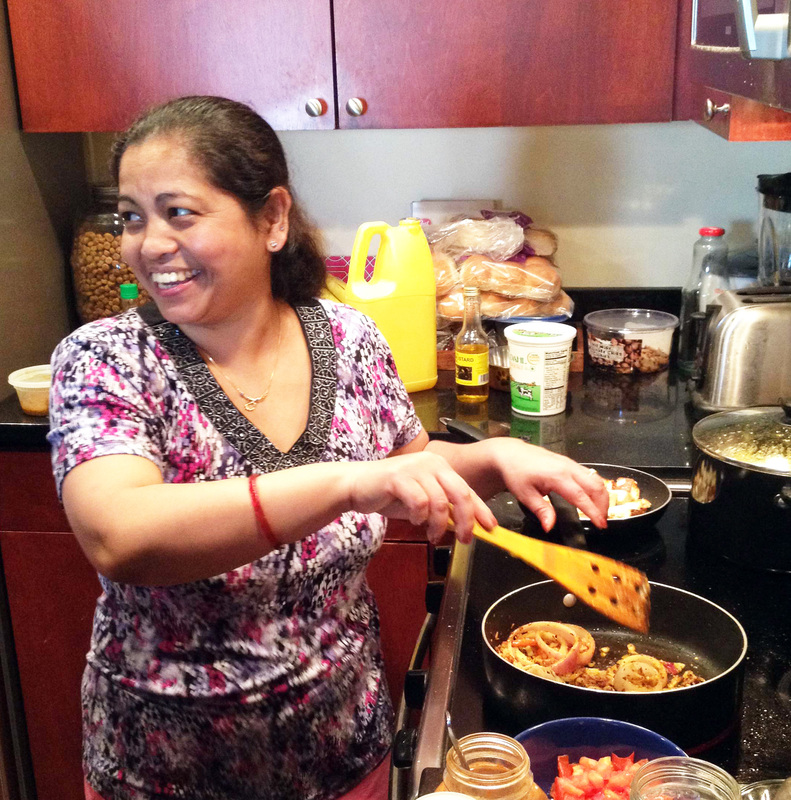 Ambikaji has been cooking for a long time, a skill that she learned from her mother from an early age. When she moved to the U.S. just a few years ago, she wanted to make her husband and two boys feel at home. “What do you like to cook?” I ask her. And she did, so here is the recipe and a few tips to help you achieve the final result, which, I must admit, takes a little bit of practice. The hard part is sealing the momo correctly and gracefully, so that it looks like a proper momo and not roadkill, which was what mine looked like at first, and which made Ambikaji chuckle. Watching Ambikaji make momos was a window into this woman’s work ethic: she’s a perfectionist, detailed-oriented, and gentle, handling her ingredients carefully and mixing spices thoughtfully. For me, it was such a privilege to be in the kitchen with her, and it has been a great treat to savor her food every Saturday. Cover and allow to rest for 30 minutes to one hour in the fridge. Fill your momos following this technique: https://www.youtube.com/watch?v=SMdd9ViqsVY (starting at minute 9). 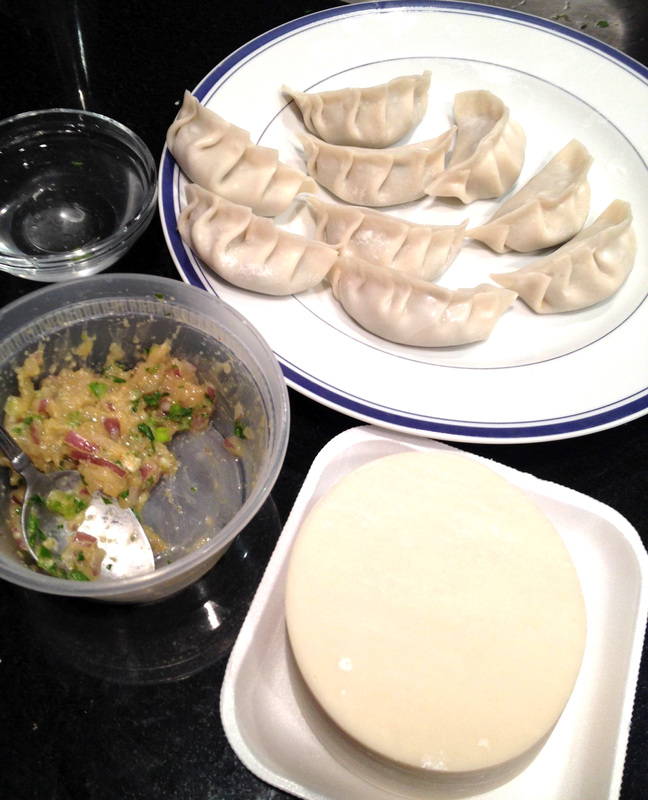 Put momos on a dish and freeze them (about two hours). 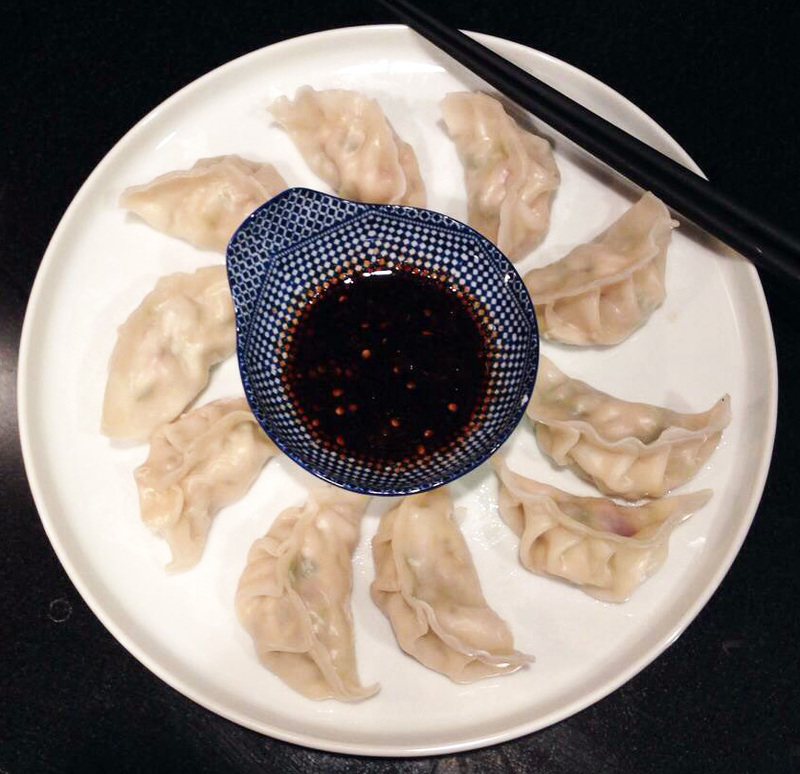 Place frozen momos in a steamer apart from each other so they don’t stick. You can place them on parchment paper or brush the base with a little bit of oil to prevent them from sticking to the steamer. I mixed together some soy sauce, rice vinegar, toasted sesame oil, minced ginger, and a little bit of minced garlic. It was great. 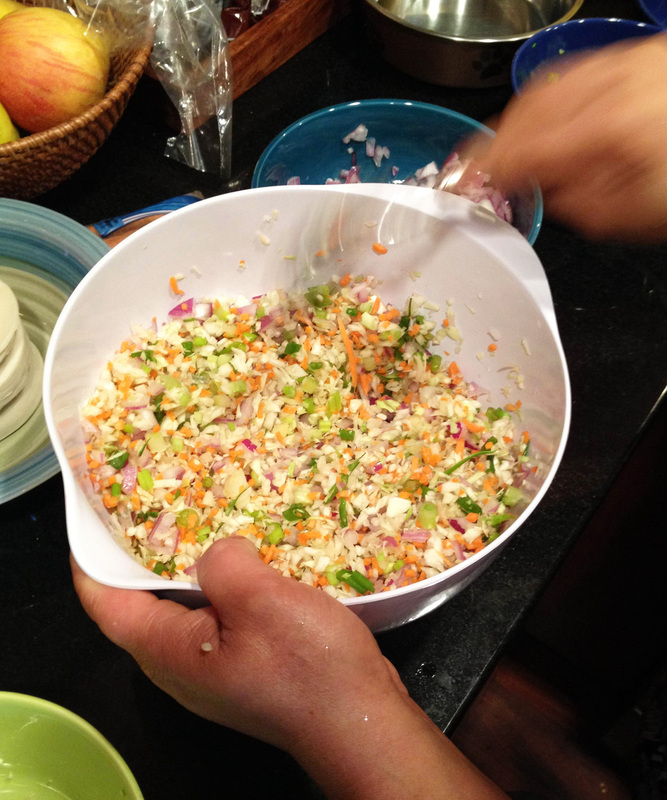 Here’s a chutney recipe that looks yummy. Tip: to make chicken momos use the same ingredients except for the cabbage and carrots, which you can replace with 1 ½ cup of finely chopped chicken breast (raw). Steam for 15 minutes to allow for the chicken to cook through. These look delicious, I’m going to have to try my hand at cooking these. Consistently impressed with the diversity of your recipes and the people behind them. Keep the posts coming! Thanks, Zach. So good to hear your feedback. Good luck trying the momos. They’re tasty! Bruce: I’ll ask Ambikaji if you can be added to the list… It’s definitely worth trying.